Make sure the tire pressures are correct. The driver or someone who weights the same should sit in the driver's seat. NOTE: The fog lights should aim down slightly. To check for proper adjustment. Park the vehicle in front of a wall or a screen (A). Turn the front fog lights on. 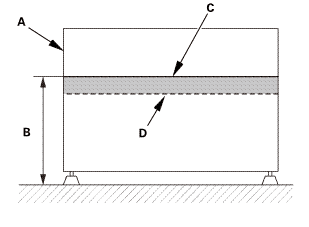 Measure the height of the front fog lights (B). On the screen or wall, mark the height of the front fog lights with a piece of tape mark (C). 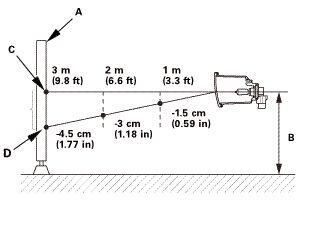 With the vehicle parked 3 m (9.8 ft) from the screen, the top of the front fog light beam should be 4.5 cm (1.77 in) (D) below the tape mark. 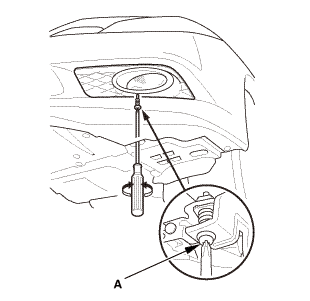 Adjust the front fog lights by turning the adjuster (A).